FRANKLIN, Mass. 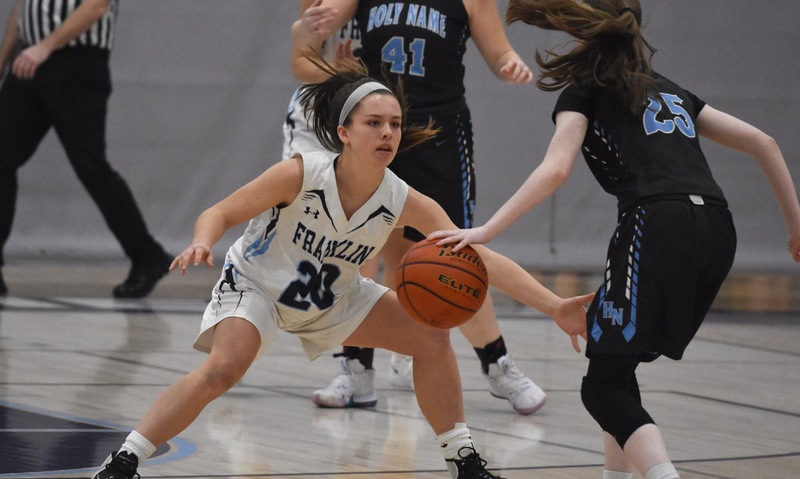 – With only a few minutes left in the first half, Franklin sophomore center Ali Brigham made a scored in the lane to put the Panthers ahead 17-12 against defending Davenport division champion Foxboro. It would be Franklin’s largest lead of the game. Foxboro rolled off 20 straight points between the second and third quarters (including the first 18 points of the second half), closed the game on a 52-16 run, and ran out to a 64-33 victory. Franklin took an early lead during a first quarter that was largely dominated by both teams’ pressure defenses. After Brigham (12 points and 15 rebounds) scored of an assist by freshman Elizabeth Wilson, the Panthers took an 8-3 lead. Foxboro battled back to tie the game but Bea Bondhus got free on the baseline for a buzzer-beating layup off an inbounds to make it 10-8 after one quarter. Brigham started to take over in the second with a personal 7-0 run that made it 17-12. 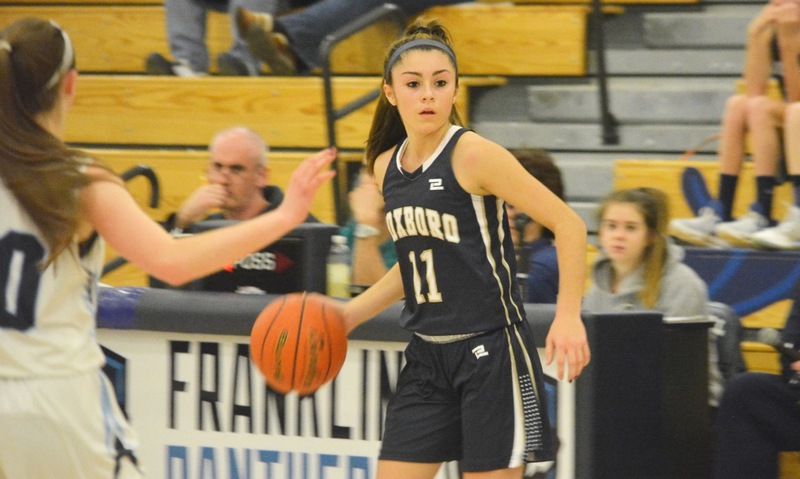 Needing a spark, Foxboro got momentum not from its experienced stars but from newcomer Katelyn Mollica (18 points, three assists, and three steals). The freshman guard got a steal and scored on the break to cut the lead to three, as part of her six points in the quarter. Grace Tamulionis knocked down a three off an assist by Ashley Sampson to put Foxboro ahead and Lily Sykes (10 points, six assists, and three steals) nailed one from distance as well. After a Calen Frongillo reverse brought Franklin within one, Sampson closed the half with a drive at the buzzer to give Foxboro a 24-21 lead at the break. It was the start of a 20-0 run that sealed the win. Sampson, the reigning Hockomock League MVP and Adelphi University-commit, took over the game in the second half. She scored 17 of her game-high 21 points after the break and added five rebounds, four assists, and four steals with her future college coach in the stands watching. She started the half with four quick points then assisted on a jumper by Mollica. Sykes kicked a pass out to Tamulionis for her second three of the game and assisted on a jumper by Abby Hassman. Mollica drilled her second three of the game and then Sampson buried one as well and suddenly it was a 42-21 lead. 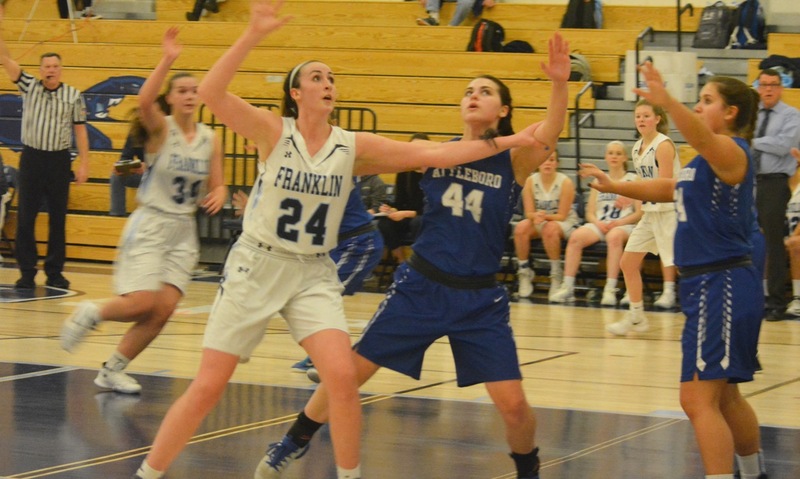 Franklin scored only three points in the third quarter, all three by Megan O’Connell (seven points and six rebounds), and the on-the-ball pressure of the Foxboro guards made it very difficult for Brigham to get any touches in the post. The reigning Underclassman of the Year was held to just a single made free throw in the second half. The Panthers tried several different defensive looks in the game, but Foxboro’s experience was evident with the ball moving from player to player and the extra pass giving the Warriors consistent open looks. Foxboro added 21 points in the fourth, putting the game away and ensuring there was no comeback. Foxboro (3-1, 3-0) will try to extend its three-game win streak when it hosts fellow Div. 2 competitor Hopkinton on Thursday, while Franklin (3-1, 2-1) will host Coyle & Cassidy in an exclusion game. Attleboro, 50 @ Canton, 53 – Final – Canton held a one-point lead at halftime (28-27) but used an 8-0 run to start the second half to create the separation it needed. The Bulldogs went up 51-41 with 5:29 to play, but Attleboro’s switch to a zone defense stalled Canton’s offense and got the Bombarders back into the game. Attleboro had a 9-2 run and had a chance to tie the game at the buzzer but the shot missed and Canton picked up its first win over Attleboro since 2013. Senior Tony Harris scored a game-high 18 points while hauling in 15 rebounds, senior Austin Maffie added 11 points and junior Devin Foster finished with 10 points and seven rebounds. Attleboro junior Dom Victor had a team-high 16 points while sophomore Qualeem Charles had 12 points. Mansfield, 50 @ Foxboro, 43 – Final – Click here for a recap and photo gallery of this game. King Philip, 53 @ Milford, 47 – Final – Milford held the lead until the final minutes of the game, but King Philip took the lead late and earned the win on the road. Milford junior Brendan White dropped a career-high 20 points while senior Kayden Kelley had 15 points for the Hawks. Oliver Ames, 64 @ Stoughton, 53 – Final – Stoughton rallied at the end of the first half, using seven straight points from senior Greg Firmin (career-high 14 points) to take a 34-32 lead at halftime. But Oliver Ames switched to a 2-3 zone and took control of the game in the second half. OA senior Jack Spillane led all scorers with 24 points while junior Jake Erlich scored 13 points for the Tigers. Taunton, 64 @ Sharon, 62 – Final – Sharon overcame a 13-point deficit over the final 90 seconds and had a chance to win it at the buzzer, but came up just shy. Taunton jumped out to a 20-10 lead after the first quarter before taking a 34-25 lead into the locker room. The Tigers kept their lead in double-digits, 50-40, heading into the final quarter. Sharon outscored Taunton 22-12 in the final frame but the Tigers escaped with the win. Sophomore Dante Law netted a team-high 20 points for Taunton while junior Lou Vendrell scored a career-high 18 points. Sharon senior Malik Lorquet led all scorers with 22 points and 12 rebounds, Jimmy Fitzhenry added 14 points and Lester High had 11 points. Canton, 39 @ Attleboro, 37 – Final – Hannah Jerrier scored 13 points and pulled down 10 rebounds and Erin Devine added eight points, eight rebounds, three blocks, and three assists as Canton rallied in the final minute to open its season with a road victory. The Bulldogs trailed 37-36 with a minute left and scored to take the lead, adding a free throw in the final 20 seconds. Julia Hamilton added seven points and seven rebounds for the Bulldogs. Attleboro was led by Sam Pierce’s 12 points, while Jordyn Lako scored 10 in the loss. 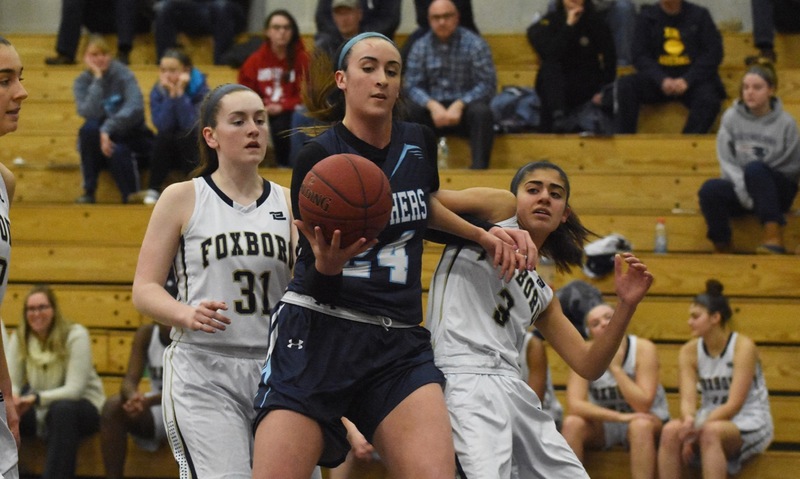 Foxboro, 43 @ Mansfield, 37 – Final – The Warriors got 12 points from Grace Tamulionis and nine points from Lily Sykes (on a combined five three-pointers) to win the Hockomock opener for both teams in a battle of last season’s league champions. The Warriors took the lead with a 15-6 fourth-quarter run. The game was tied 37-37 with 2:00 remaining and Shannon Smally scored the go-ahead basket for Foxboro. Mansfield got 11 points, 12 rebounds, and four blocks from Meg Hill and nine points on a trio of three-pointers from Ann Maher. 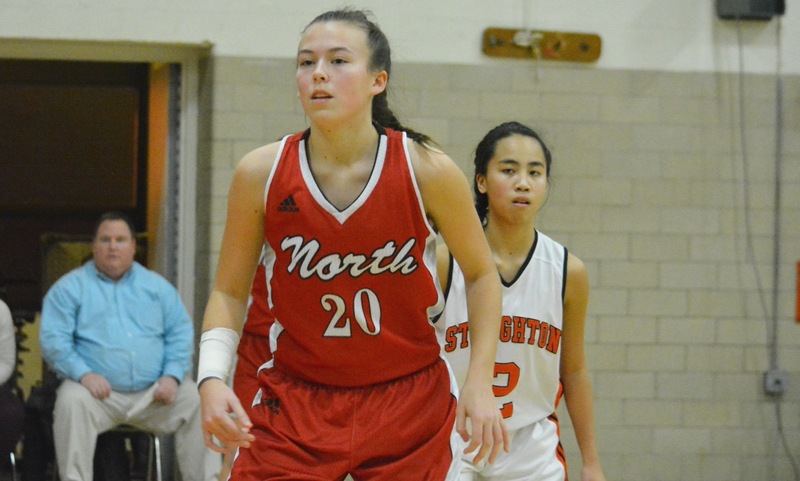 North Attleboro, 37 @ Franklin, 61 – Final – Ali Brigham scored 16 points to lead Franklin to a win in the Hockomock League opener for both teams. Bea Bondhus added 15 points and freshman Elizabeth Wilson had 12 for the Panthers. Milford, 56 @ King Philip, 64 – Final – Shannon O’Connor scored a game-high 26 points to give new head coach Amy Siggens a win in her first game in charge. Faith Roy added 10 points and Faye Veilleux had nine for the Warriors. Siggens said it was a total team effort and highlighted KP turning the ball over only 10 times in the game. She added, “They just played so well together.” Milford was led by Kate Irwin with 22 points and Emily Piergustavo scored 16 in the loss. Stoughton, 48 @ Oliver Ames, 55 – Final – Oliver Ames held a comfortable 45-29 lead after three quarters, but the Knights rattled off a 17-4 run over the first five minutes of the final quarter to make it a three-point game. OA’s defense clamped down and allowed just two more points the rest of the way while Abby Reardon and Tori Harney hit key free throws to seal the win. Kayla Raymond scored 25 points and Caroline Flynn added 14 to lead Oliver Ames to a season-opening victory. Sharon, 42 @ Taunton, 58 – Final – Taunton got 15 points from Hannah Moniz to open its season with a second straight win, exceeding the win total from last winter. 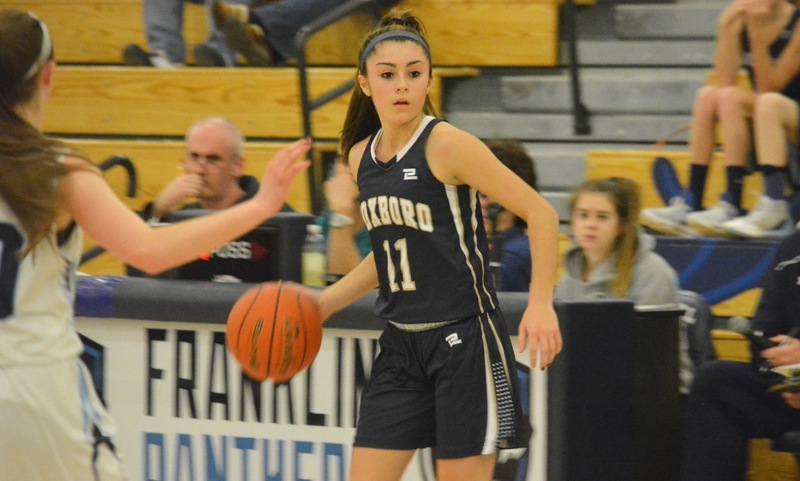 Jaelyn Fernandez added 11 points, Mackenzie Handrahan had 10 points and seven boards, Alexa White had eight points and six steals, and Lily Patneaude and Kelsey White each had seven points in the victory. Emma Eberhardt scored 21 points and Kaitlyn Wallace added 16 for the Eagles.